I know that something is wrong, you are not feeling well or you are just not performing at 100%. There are no appointments or consultations fees required, so no additional ongoing fees, which makes this test able to be delivered anywhere in the world. Keeps costs down. Feel better within 4-6 weeks, sometimes sooner. Your results are delivered with a full 13 page report outlining how you can get the best results in the shortest time and a BONUS RETEST VOUCHER. This is seriously a fast track elimination programme. “A lady came to me following the Paleo Protocol. She was experiencing gut pain, no energy, heavy black rings under her eyes. After taking the Hair Test 500 we found she was intolerant to beef and shell fish”. A friend had headaches for over 15yrs off and on, after taking the Hair Test 500, she found that onions were her main trigger. The headaches were gone after the first week. Helen suffered for 15years from Eczema. She had tried creams, lotions and potions over this time with only marginal results. After taking the Hair Test 500 her Eczema had started to visibly clear within 4 days. The main offenders on the list were Lettuc, Chicken, Mushrooms and Whiskey. A mum took a Hair Test 500 for her son who had terrible acne. The food test revealed that bread was a major problem for him. By reducing the bread in his diet by 80%, his acne signficantly reduced to the point where he became self motivated and cut the bread completely. My son was getting random pains in the stomach, I could not pin point what he was eating and what was making him feeling sick. We discovered that food colourings were a major problem for him, once we cut out all the colours the sickness stopped. If you are ready and want help now here is the link for you to go straight away and order the Kit. Order your Hair Test 500 System Now! Introducing new Zespri SunGold Kiwifruit. Your daily dose of vitality! The new Zespri SunGold Kiwifruit is now in season and ready to eat! Refreshingly delicious and juicy this kiwifruit is -packed with nutritional goodness. Developed through natural plant breeding techniques, the remarkable Zespri SunGold Kiwifruit is the culmination of more than 10 years dedication to its research and natural development by New Zealand horticulturalists. The result is this golden-fleshed variety that is sweet with just a touch of tang to give the SunGold kiwifruit a well-balanced flavour profile complemented by a delicate texture inside a smooth, bronze skin, unlike its hairy green cousin. More than just a delicious treat, Zespri SunGold Kiwifruit is one of nature’s most nutrient-rich fruits1, a nutritious superfood delivering an abundance of essential elements for wellbeing and vitality. In fact, the new Zespri SunGold kiwifruit variety is one of the richest sources of Vitamin C. It has three times the Vitamin C amount of oranges and provides more than the recommended daily Vitamin C requirement2, ideal for the winter months when colds and flu are most prevalent. A good source of potassium, folic acid, vitamin E, carotenoids, other antioxidants3 while also low in calories and with a low glycaemic index4, Zespri Kiwifruit deliver a wide range of health benefits and are perfect to enjoy every day. Simply cut and scoop Zespri SunGold Kiwifruit for a nutritious breakfast or snack at any time of day. Or add this outstanding fruit to cereal, a nourishing smoothie or the easy-to-prepare Zespri SunGold breakfast pudding. So refreshing and juicy! For the ultimate in vitality and wellbeing, purchase Zespri SunGold Kiwifruit from green grocers and major supermarkets until mid-September. Chen, Y.-Y., Wu, P.-C., Weng, S.-F., & Liu, j.-F. (2011). Glycemia and peak incremental indices of six popular fruits in Taiwan: healthy and Type 2 diabetes subjects compared. Journal of Clinical Biochemistry and Nutrition, 49(3), 195-199. doi: 10.3164/jcbn.11-11. If you’re gluten intolerant and envy the taste of delicious Hot Cross Buns or simply seeking a gluten-free alternative, this Easter indulge with pleasure! The food innovator in the gluten free category, Simply Wize presents Simply Wize Gluten Free Hot Cross Buns. And, like the best of Easter buns, they’re truly delicious! The delectable Hot Cross Buns are full of fruit and spicy flavour with the outstanding taste and soft texture of traditional Hot Cross Buns. 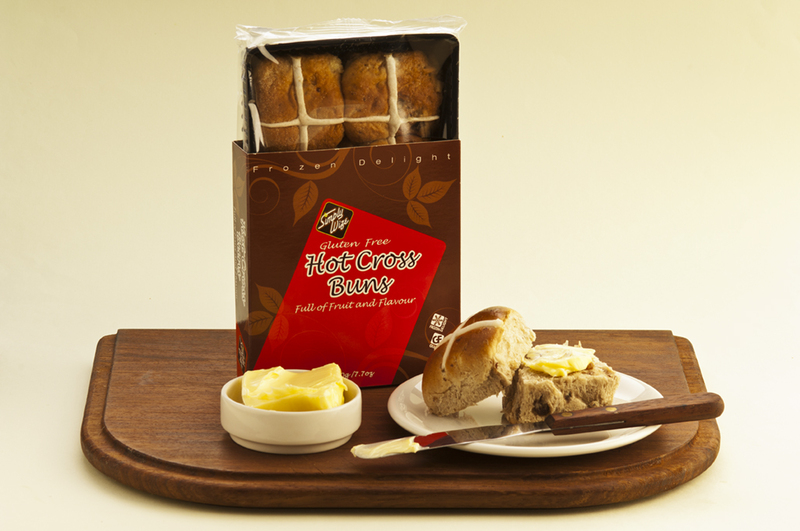 Baked to perfection and frozen immediately to seal in the freshness, simply heat the Gluten Free Hot Cross Buns in an oven or microwave as the pack indicates. The luscious aroma is complemented by the great taste, texture and quality of these ready-to-eat gluten-free Easter treats. A perfect choice for the increasing number of those pursuing a gluten free lifestyle, the delicious Hot Cross Buns are the latest addition to the Simply Wize line-up of quality Australian-made and owned gluten-free products. A Daily Scoop of Amazing! Bursting with the nutritional value of essential vitamins and minerals Zespri® Green and Gold Kiwifruit are now both in season! Check out those Zespri® Gold Kiwifruit with their lusciously melon, peach and citrus flavours that continue to be popular. But you’ll have to be quick as this season concludes in October. They share space in green grocers and fresh produce sections of supermarkets with the tangy taste of Zespri® Green Kiwifruit, here until December. So enjoy Zespri® Kiwifruit every day! Simply cut the fruit in half and scoop out the soft flesh with a spoon or a spife, that combination spoon/knife created in New Zealand. Ideal for a quick breakfast, a snack-on-the-run and children’s lunchboxes, Zespri® Kiwifruit are incredibly versatile. Why not blend them into a smoothie, dice them into a salsa, baked with chocolate into muffins and frozen as a sorbet…. there are just so many great recipe ideas using Zespri® Green and Gold Kiwifruit! European Commission (2102) EU register on nutrition and health claims. www.ec.europa.eu/nuhclaims (accessed 22 June 2012). Han, K. S., P. Balan, et al. (2011). “Green kiwifruit modulates the colonic microbiota in growing pigs.” Letters in Applied Microbiology 52(4): 379-385. Du, G., M. Li, et al. (2009). “Antioxidant capacity and the relationship with polyphenol and Vitamin C in Actinidia fruits.” Food Chemistry 13(2): 557-562. Kaur, L., S. M. Rutherfurd, et al. (2010a). “Actinidin Enhances Gastric Protein Digestion As Assessed Using an in Vitro Gastric Digestion Model.” Journal of Agricultural and Food Chemistry 58(8): 5068-5073. Kaur, L., S. M. Rutherfurd, et al. (2010b). “Actinidin Enhances Protein Digestion in the Small Intestine As Assessed Using an in Vitro Digestion Model.” Journal of Agricultural and Food Chemistry 58(8): 5074-5080. Rutherfurd, S. M., C. A. Montoya, et al. (2011). “Effect of actinidin from kiwifruit (Actinidia deliciosa cv. Hayward) on the digestion of food proteins determined in the growing rat.” Food Chemistry 129(4): 1684-1689. Brevik, A., A. Karlsen, et al. (2011). “Both base excision repair and nucleotide excision repair in humans are influenced by nutritional factors.” Cell Biochemistry and Function 29(1): 36-42. Collins, B. H., A. Horska, et al. (2001). “Kiwifruit Protects Against Oxidative DNA Damage in Human Cells and In vitro.” Nutrition and Cancer 39(1): 148-153. Collins, A. R., V. Harrington, et al. (2003). “Nutritional modulation of DNA repair in a human intervention study.” Carcinogenesis 24(3): 511-515. Rush, E., L. R. Ferguson, et al. (2006). “Kiwifruit consumption reduces DNA fragility: a randomized controlled pilot study in volunteers.” Nutrition Research 26(5): 197-201. Rush, E., & Drummond, L. N. (2009). The Glycaemic Index of Kiwifruit. New Zealand Kiwifruit Journal, 192 (May/June), 29-33.